Most cars from 2000 and later come equipped with an added security measure. By adding a chip inside the plastic piece of a car key, the key is integrated with a code that will relay to the computer and disengage the kill switch. This feature makes it more difficult for your key to be illegally duplicated. This is why car key programming is now a very common service our customers need. Because we’re completely mobile we can get your car key programming service done in about half an hour or less. We are available 7 days a week, and all of our car key programming services are done by a local, in-house locksmith. All Sevan locksmith’s vehicles are fully equipped with the latest state of the art tools to make new car keys and provide car key programming on the spot. Transponder keys are cut the same as a basic key but have a transmitter + responder chip located inside the plastic piece. The key chip and the computer need to be perfectly in sync in order to start the vehicle. Transponder keys are quite common on mid-class vehicles such as Honda, VW, Toyota, and other makes and models. 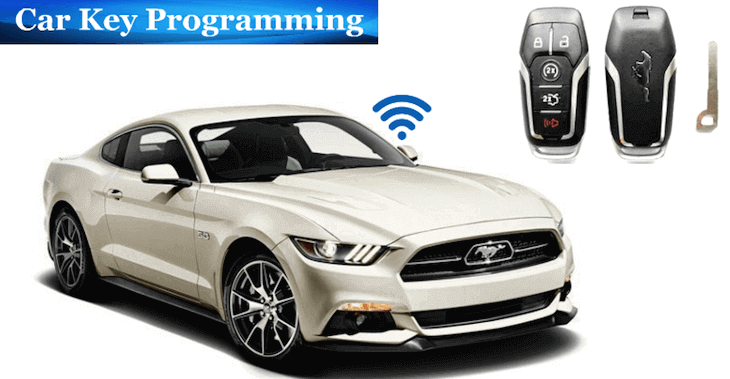 Transponder car key programming done by those without the knowledge or tools can render your security system completely immobile. It will eventually lock you out if they continue to try and program an incorrect code. This is why we train our car key programming locksmiths on every issue that may occur when programming a car key. We also provide them with the tools required to get the job done right the first time. Laser cut keys are becoming one of the most popular security systems available for vehicles on the market today. Almost all new cars that are 2011 and younger are being installed with this exceptional piece of technology. Laser cut car keys need to be programmed so the immobilizer will disengage and the engine can start. However, laser cut keys offer even more protection than transponder keys because they are cut to a snake or dimple pattern that provides a 1 in 30,000 chance that someone else has the exact same key as you. These types of keys take longer because they are more advanced and require a more complex programming system than regular transponder keys. Our car key programming team is capable of programming both your key and the vehicle’s computer the same day, usually within an hour. Car key programming requires knowledge and professional equipment. If not done properly it can cause immobilizer issues in the future. Save your time and money by contacting our professionals at Sevan. We make sure that we never charge extra for nights, weekends or holidays. We always guarantee our work with the best extended warranty you will be able to find. No matter what type of vehicle you have, our auto locksmith team is capable of programming your key and computer the same day you call. We understand how complicated car key programming can be. That’s why we train our locksmiths to assess what needs to be done before attempting any programming. We can program any car key, including luxury vehicles such as Lexus, Cadillac, and Infiniti. Contact Sevan Locks & Doors today for emergency car key programming service, same day responses, or to learn more. We are available at (206) 274-7061. Our friendly local locksmiths are always ready to assist you with your car key programming needs.